Washington: The United States on Thursday displayed pieces of what it said were Iranian weapons deployed to militants in Yemen and Afghanistan, a move by President Donald Trump’s administration to pressure Tehran to curb its regional activities. Much of the hardware presented by the Pentagon was handed over by Saudi Arabia. If Iran were found to be shipping arms to Yemen, Afghanistan and other countries, it would be in violation of UN resolutions. “We want there to be no doubt across the world that this is a priority for the United States and that it’s in international interest to address it,” said Katie Wheelbarger, the principal deputy assistant secretary of defence for international security affairs. The presentation, the second such one in the last year, is part of a government-wide effort to take a harder line toward Tehran. The Pentagon offered a detailed explanation of why it believed the arms on display came from Iran, noting what it said were Iranian corporate logos on arms fragments and the unique nature of the designs of Iranian weaponry. The United States acknowledged it could not say precisely when the weapons were transferred to the Al Houthis, and, in some cases, could not say when they were used. There was no immediate way to independently verify where the weapons were made or employed. This included a “Sayyad-2” surface to air missile, which the Pentagon said had been interdicted by the Saudi government in early 2018 on the way to Al Houthi militants in Yemen. 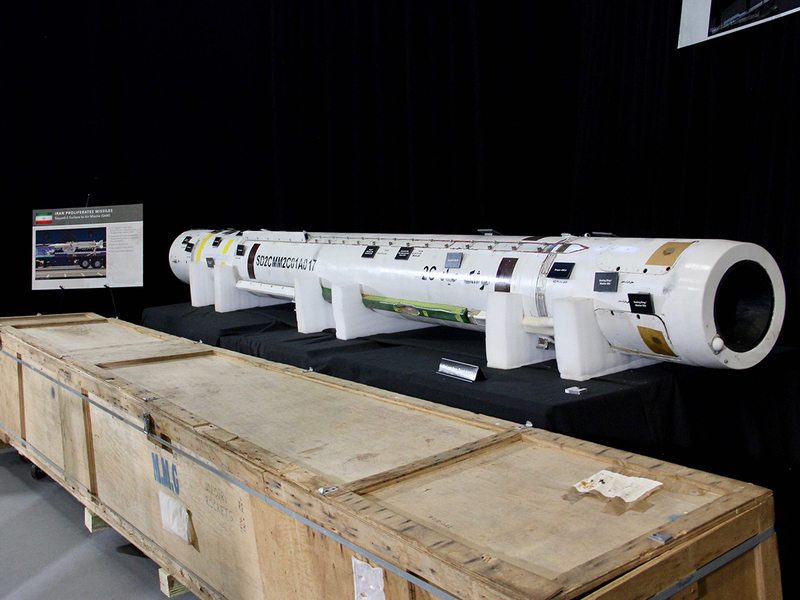 The Pentagon cited a corporate logo of an Iranian defence firm in the warhead section, which was not displayed, and writing in Farsi on the missile as evidence that it was Iranian. A US defence official, speaking on the condition of anonymity, acknowledged that the Pentagon did not know if the Houthis had actually used this type of missile before. The Houthis, who control Yemen’s capital Sanaa, have fired dozens of missiles into Saudi Arabia in recent months, part of a three-year-old conflict. Under a UN resolution, Tehran is prohibited from supplying, selling or transferring weapons outside the country unless approved by the Security Council. A separate UN resolution on Yemen bans the supply of weapons to Al Houthi leaders. It was unclear what impact, if any, such public displays of weaponry will have on Iran, US allies and militants in the region. A short-range missile on display was fired just five days after US Ambassador to the United Nations Nikki Haley did a similar presentation last year. “I haven’t heard anybody say this is a political stunt. This is simply putting out in broad daylight Iran’s missiles and small arms and rockets and UAVs and drones,” US special envoy for Iran, Brian Hook, told a news conference on Thursday after being asked whether the weapons display was done for propaganda reasons. Hook said that today Al Houthi rebels had fired missiles into Saudi Arabia and that while the United States had the military option on the table, the preference was to use diplomatic efforts to deal with Iran. The United States has also long accused Iran of providing weapons to Taliban militants in Afghanistan. The Pentagon on Thursday displayed a number of “Fadjr” rockets, that it said had been provided to the Taliban. It said they were Iranian because of the unique markings on the rockets and the paint scheme, along with the markings on them. The Taliban is known to buy weapons on the black market and defence officials could not say why they were sure these missiles and other weapons had not been simply bought by the militants.